Western pommel saddlebags with spots and a floral concho on each flap. Underneath the flaps, on both sides, is a pocket and a pistol holster. This pommel bag is handcrafted, made with quality leather and is extremely durable. Excellent addition to any outing where you need additional handy storage, great for the extras that you need readily at hand while riding. Available in three colors: Black, Brown and Natural. History of the Pommel Bag: The first form of gunleather used widely throughout the west was the pommel holster that was used originally by the military in Europe and then in the US colonies. These were made commercially by companies that were supplying the military and were the easiest way to carry the cumbersome pistols and needed accessories of the time. In the early 1800's frontiersmen used large-bore, single shot handguns commonly known as "horse" pistols. They used these mainly for game hunting and protection. The pommel bag holster is believed to have been developed in the California Gold Rush era where it was used by Wells Fargo in the gold fields. When revolving cylinder handguns became available in the 1850's most people quickly went to using gun belt mounted holsters and the pommel bag holster. The pommel bag holster had a limited popularity through the early 1900's by those who felt the need for more firepower such as law enforcement.....four loaded guns are always better than two! It was also a convenient way to have gun, extra ammunition and hard tack close at hand while riding (without having to turn to access your regular saddlebags) and much more accessible than a belt mounted rig in cold or wet weather when you were heavily bundled up against the elements. The Pommel Bag Holsters were available from simple plain bags to the heavily ornate with carving and ornamentation. This was also known as a "Saddle Cantina". Cleans, softens, preserves and conditions all fine leather goods from traditional to exotic leathers. 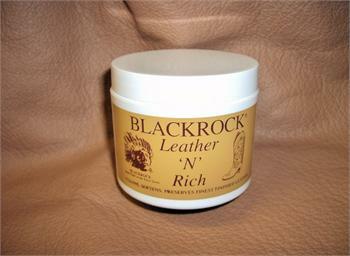 Give your leather products a beautiful finish and soft mellow luster.